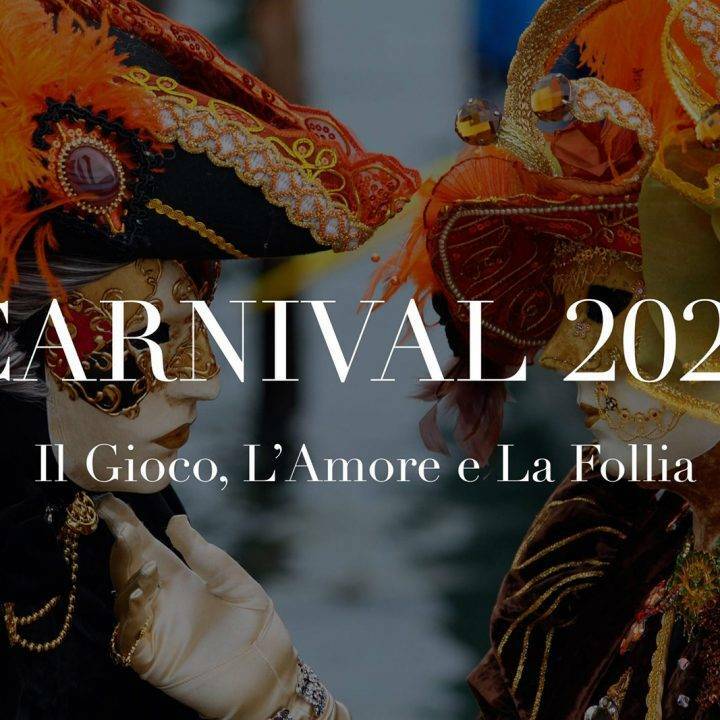 I apologise in advance if this seems like a boring topic or one that may not have been your major attraction for visiting Venice, but it is the honest truth. 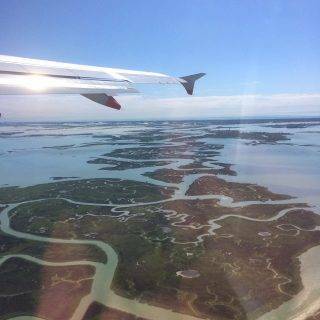 With these posts we want to show you how we walk around Venice and whilst there are countless exhibitions and Palazzos worth visiting, it is the steps in between that can also bring such pleasure. The little-known secret, is that whilst everyone is always encouraged to look up, the Venetians left nothing to chance, and even when you are looking down there is something to see. This is when you begin to understand the pleasure there is in walking in Venice. Because in no other city do you have the freedom to stop and observe, the ability to be as spontaneous and the fortune to indulge every slight curiosity of touch. A city built on salt marshes over centuries it has adapted and thrived accordingly. Venetian floor interiors have become famous worldwide for their unique style, known as Terrazzo alla Veneziana. 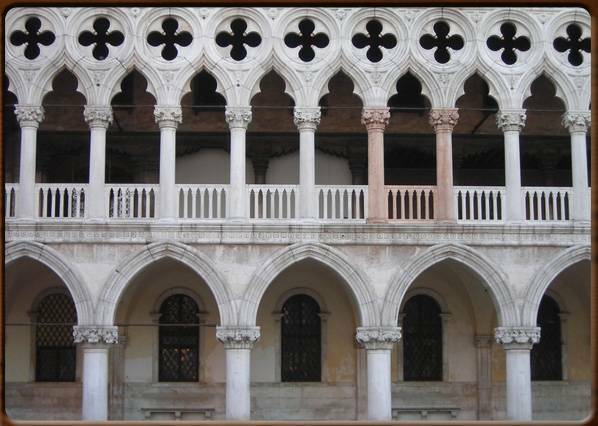 It became so popular in Venice because it allowed for the inevitable uneven surfaces and cracks that came about as a result of being built on the muddy lagoon soil. Fragments of stones, rocks and marbles of different colors are mixed with lime cement to form a paste that then spread on the floor. It is once again an ingenious solution for a problem which has now become a trade-mark of Venice. 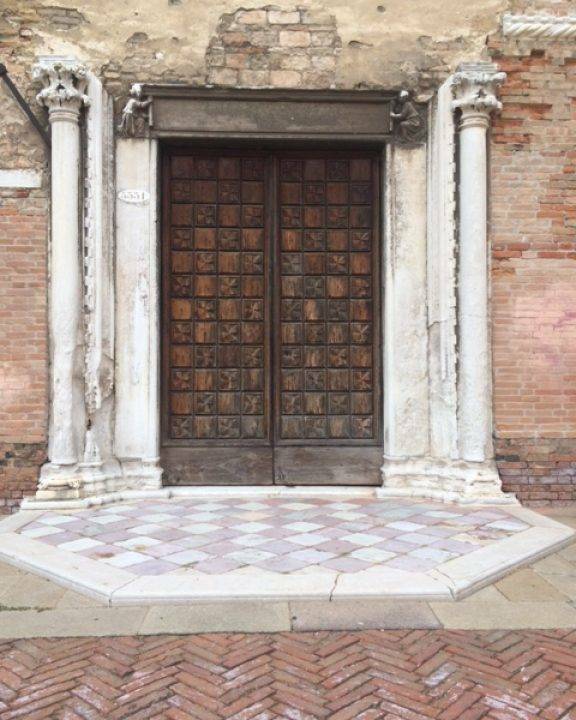 However, this method was reserved for the interiors of the buildings, when walking around Venice the majority of the stone you are walking on is Masegni stone, from the nearby Euganean Hills. But what is interesting, and often goes unappreciated is the clever design details. The stones have each been chipped in such a way as to help avoid slipping during heavy rains or during Aqua Alta. Another intelligent design is the use of white Istrian stone to indicate the borders of canals. 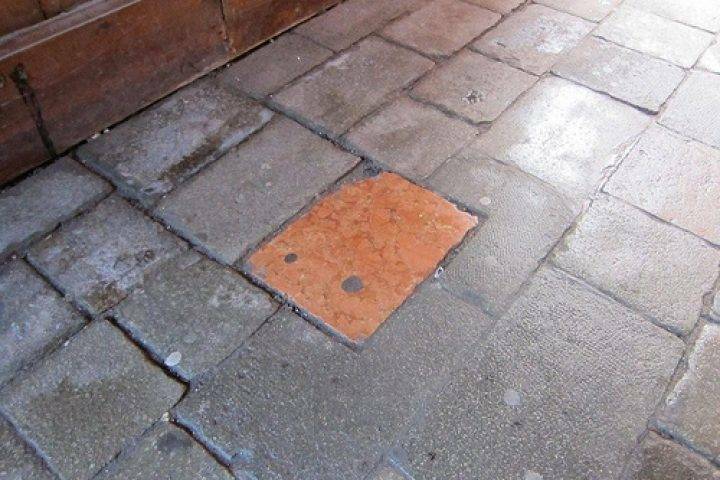 However, this Istrian Stone has not been treated in the same way as the other stone to prevent slipping, so be aware when crossing San Marks square, or the Rialto Bridge. Here are two stones of note to keep an eye out for when you are exploring…but bare in mind that these are just two amongst many. Sometimes I think that every other stone in Venice comes with a saying, curse or tradition but we cannot stop and ask a question of each one otherwise we really would get nowhere. Whilst it may not be every stone, it is certainly true that so much of the cities history and best stories can be read in the brick work. Tiziano Scarpa (Venetian author and poet) describes Venice in a way I particularly liked, ‘an uninterrupted braille handrail’. This red stone in the Sotoportego de la Corte Nova dates back to an incident during the plague of 1630, which killed more than 50,000 people in Venice alone. A young girl named Giovanna placed a painting of the Holy Virgin and three saints in the courtyard where the people prayed and amazingly, although the plague continued, it did not affect anyone beyond the picture. A slab of red marble was soon installed to commemorate the miracle. It is still unclear to me as to whether it brings good or bad luck when you step on it, personally I tend to walk around it. 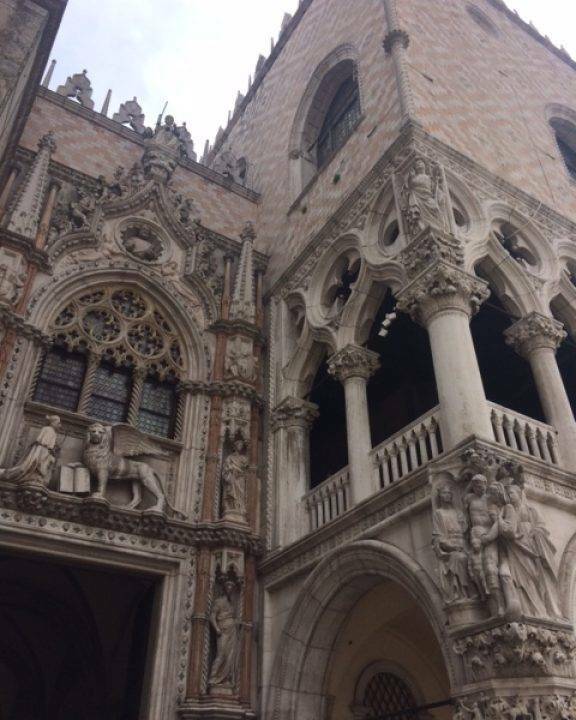 San Marco: From afar we take in the voluptuous domes and arches that are what stands so proudly at the heart of Venice. The silhouette is so familiar that we often don’t take enough time to look closely. But as with all things there is a history and when we take the time to look at the detail it can bring even greater pleasure. 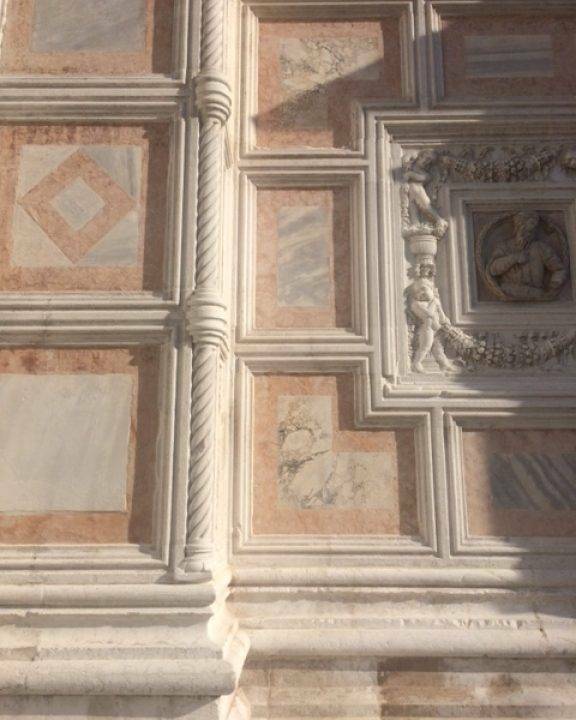 In this case, see if you can spot the two columns on the façade of the Doges Palace that are different from the others. Almost red in colour they stand out particularly as the sun hits them in the evening light. Legend has it that it was from here that the Doge would stand and observe formal occasions and announce death sentences, some even say that the more aristocratic crooks would be hung between these columns. 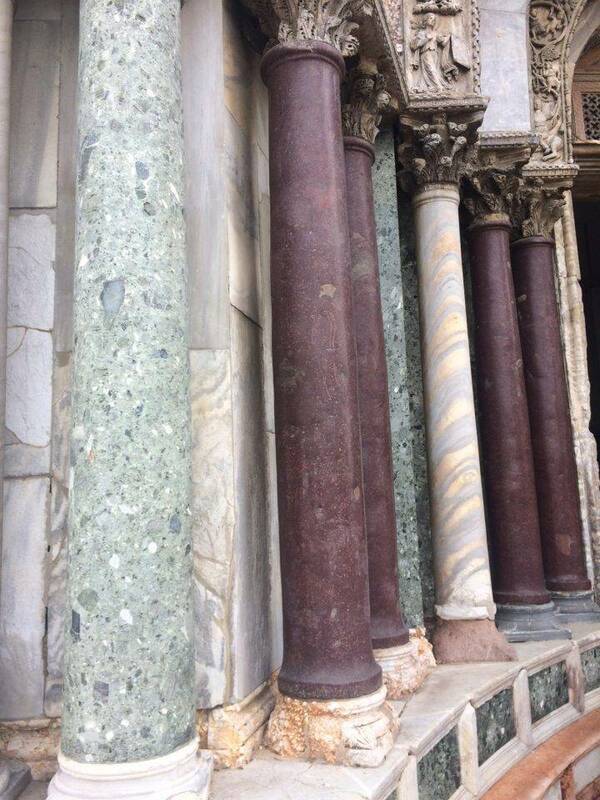 With this knowledge the stained marble almost seems sinister in colour! To conclude, whilst there are undoubtedly many more gruesome stories than this one hidden in the warped, blood-stained marble, there is also so much beauty in their layers, contrasts, soft shades and foreign origins.